It’s the most awesome workout ever. Dance to awesome music, with nice people, and burn a ton of calories without even noticing. Stepping into our Zumba Class, the most eminent Zumba spot in the town is now available everyday from 7 A.M – 10 P.M.
Gain maximum body fitality in our other fitness programs choices of aerobic, yoga class and Muay Thai. Don't let travel loosen your workout routine. 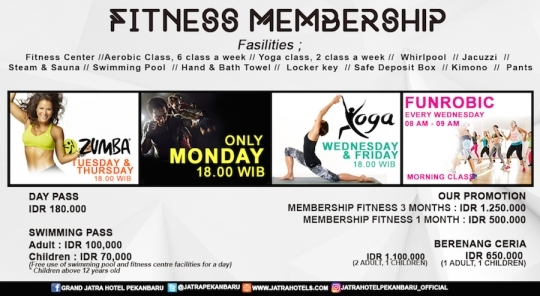 If you're looking for a hotel with sophisticated fitness equipment, Grand Jatra Hotel is the answer. Commited to a healthy living, our guest is entitled with free access in the fitness centre.